Breakfast is available daily from 7 AM to noon for a fee. 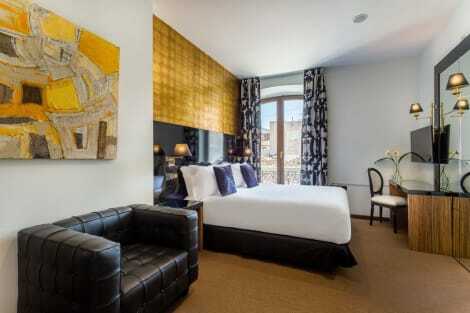 This charming design hotel is just 100 metres from Granada Cathedral, in the heart of the historic city centre. It offers stylish rooms with a private balcony overlooking Plaza Bibirrambla and a shared terrace. The spacious, air-conditioned rooms at Khu Hotel feature modern décor. Each one comes with free WiFi, a flat-screen TV, minibar and a private bathroom with a hairdryer and free toiletries. The hotel is 250 metres from Trinidad Square. Just 5 minutes' walk away you will find Elvira Street, famous for its tapas bars. Sierra Nevada Ski Resort is 40 minutes' drive away and Malaga Airport is 134 km from Khu Hotel. With a stay at Granada Five Senses Rooms & Suites, you'll be centrally located in Granada, just a 5-minute walk from Granada Cathedral and 6 minutes by foot from Plaza Nueva. This spa hotel is 0.5 mi (0.9 km) from Alhambra and 1.7 mi (2.7 km) from Alhambra. Make yourself at home in one of the 80 air-conditioned rooms featuring LCD televisions. Complimentary wireless Internet access keeps you connected, and satellite programming is available for your entertainment. Private bathrooms have deep soaking bathtubs and complimentary toiletries. Conveniences include phones, as well as laptop-compatible safes and desks. A stay at Hotel Comfort Dauro 2 places you in the heart of Granada, within a 10-minute walk of Granada Cathedral and Plaza Nueva. This boutique hotel is 0.6 mi (0.9 km) from Alhambra and 1.6 mi (2.6 km) from Alhambra.